Now that Arnold Schwarzenegger is in his post-political-career phase, he’s lined up some interesting projects to break back into movies. Some are silly—like the rumored Twins sequel—and some are just downright ridiculous, like his New Celebrity Apprentice hosting gig. But ComicBook.com’s stumbled upon some internet scuttlebutt that actually sounds pretty cool, even if it requires a grain of salt the size of Themyscira. Apparently, some eagle-eyed Twitter subscribers recently noticed that Wonder Woman director Patty Jenkins and DC Comics boss (and WW co-writer) Geoff Johns started following the former Governator on Twitter. If they weren’t currently attached to such a high-profile project, you might just think this means Jenkins and Johns enjoy Schwarzenegger’s sick presidential burns. 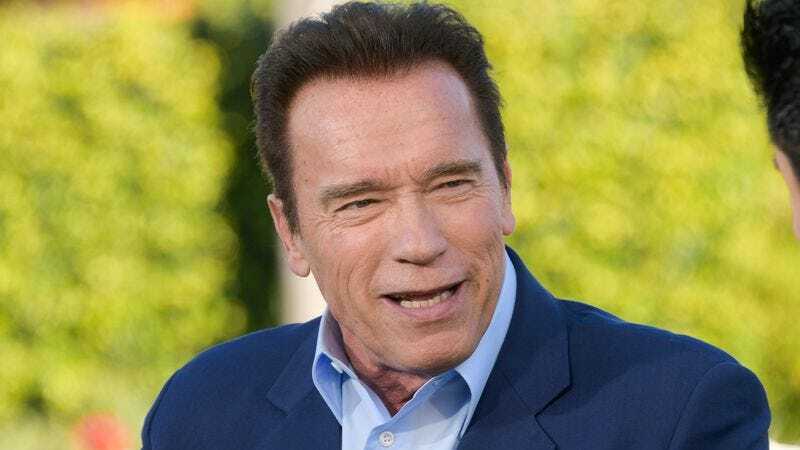 But ComicBook.com and other publications believe this is a sign Schwarzenegger is being considered for a role in the movie, since Joe Manganiello drew a lot of DC Comics execs to his Twitter feed before his role in The Batman was announced. And there’s a lot more speculation where that came from, including the possibility that Schwarzenegger will play Ares, the god of war, or that he’ll show up in a post-credits scene. The sky’s the limit, really, when we’re just dream-casting a movie that’s already wrapped filming. Wonder Woman hits theaters June 2.